This week at In The Past Lane, the history podcast, I speak with historian Mitch Kachun about his book, The First Martyr of Liberty: Crispus Attucks in American Memory. Attucks was the man of African American and Native American heritage who was among the five people killed in the Boston Massacre on March 5, 1770. To this day, very little is known about Crispus Attucks. So Mitch Kachun’s book focuses, as the subtitle suggests, on the memory of Attucks and how it’s changed and evolved over nearly 250 years of history. Who Crispus Attucks was and what we know about why he was killed in the Boston Massacre. How for many decades after the Boston Massacre and American Revolution, Crispus Attucks was a forgotten figure in US history. That is, until African American abolitionists in the 1840s and 1850s began to celebrate Attucks as a patriot as a way to bolster their demand for an end to slavery and the inclusion of blacks as full citizens of the republic. How and why in the decades after the Civil War, as the freedoms won by African Americans were stripped away and replaced by Jim Crow white supremacy, black Americans clung to Crispus Attucks as a hero. As part of this process, they embellished his biography to make him appear every bit a patriot as Paul Revere and Samuel Adams. How African American historians worked to have Crispus Attucks included in US history textbooks, something that finally began to happen in the 1960s during the era of the civil rights movement. How some radical African American civil rights activists like Stokely Carmichael rejected Crispus Attucks as a model for black liberation. How the story of Crispus Attucks and his presence – along with many other people of color – at the Boston Massacre serves as a reminder that American society has been diverse from the very beginning. 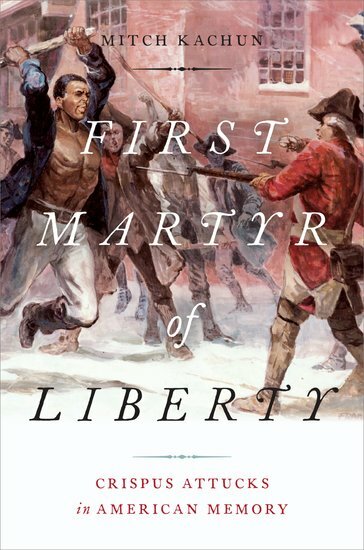 Mitch Kachun, The First Martyr of Liberty: Crispus Attucks in American Memory.